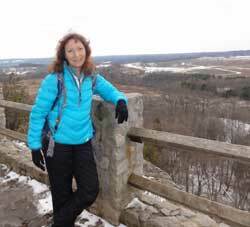 Well it’s “crunch, crunch” time, and I don’t mean the sound of the snow underfoot at Rattlesnake Point this past weekend. I mean less than seven weeks to go until Kili departure. I’m feeling it now…the need to focus on strengthening even further those muscle groups that will see me up and down the mountain with a maximum of joy and a minimum of woe. What does that mean? To me it means more work on hams, quads, knees and glutes (must target for those buns of steel! ), and less on upper arm and core strength (for I know well now that I can tolerate 15 lbs on my back for four or five hours). So Saturday morning with Cecilia–my fabulous, over-the-top enthusiastic friend and personal trainer–I declared, “No more weight training for now, please. Lots of legs, instead.” And so, after leg-focused mat work, we “stepped” non-stop to funky, thumpy club-style music for 50 minutes, followed by a good stint on the leg press equipment. Whew! That was how I spent my Saturday morning, November 27th–two “glorious” hours of good, hard ‘workin’ out”. 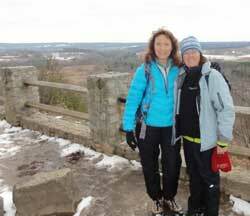 Sunday, November 28th had me back at the Rattlesnake to Crawford Lake portion of the Bruce Trail. My Kili climbing “buds” chose a Toronto urban trail for this weekend, but I had a hankering to get out to the country again for my weekend hike. I’m really enjoying being a “non-fair weather” hiker. And, anyway, I’m starting to see that “fair weather” is all in the eye of the beholder, for Sunday really was, in my opinion, a wonderful early winter-like day for a 17 K trek. A little snow on the ground and more than a bit cold to start-minus 4 Celsius–but it warmed up to 4 wholes degrees above by the 4 hour mark. Something about 4’s on Sunday I guess…on this fourth Sunday of November! I didn’t hike with my Kili buddies this past Sunday but, rather, with Wendy Brennan (an old friend from my teenaged, competitive figure skating days). Wendy found me on-line five years ago and we’ve stayed in touch ever since. My goodness how Google can resurrect old friendships! Back in the summer she kindly let me know she’d like to accompany me on some of my training hikes and this past weekend was finally the time. John ??? kindly offered to capture the ritual, obligatory picture of us for this day’s hike, from the Nelson Scenic Lookout at Rattlesnake Point (and by the way, I’ve met the nicest people on the trails over these past several months; hikers are a very friendly sort, indeed. I’ve often commented lately to my single friend, “If you’re looking to meet someone, I suggest foregoing E-Harmony and “take a hike” instead!). So that was Saturday’s and Sunday’s training regime. And what about Monday, you ask? Wendy has recently returned to teaching figure skating and told me of Toronto’s adult-only skating hours at several city rinks. I’ve now decided to skate for 2 hours every Monday as an alternate form of “legwork.” And I’m talking solid, pushing hard and non-stop power skating. Despite my professional figure skater status (from 30 years ago), it’s been a long, long time since I’ve skated with that kind of passion. I sure had a bit of temporary shin splints pains last week after my skating session, but I hope this week is better. Wish me luck! And, for me, it’s such a lovely slip into a fissure in the “space-time continuum” to skate again. Funny what has to happen sometimes before we return to an old “love”, eh? I’m not doing double jumps (there’s no glory in it for this old lady now! ), and only a few simple spins, but I am performing all the Skate Canada dances and, together with Wendy, we’re making sure to cover all the dances-even the Gold levels ones. Great fun and great workout, indeed! Sometimes you really can go back, after all. P. S. Among all sorts of other fringe benefits to committing to this climb, a biggie for me is brining a dear circle of friends and family into my hiking and training fold and introducing (or reintroducing) them to the pleasure of day-long hikes. Like any hard or challenging task one must complete, a “little help from my friends” has certainly helped me “get by” and get prepared for Tanzania. To date my dear “non-Kili” friends that have keenly accompanied me on long, and sometimes difficult, training hikes include: Cindy Nowina (multiple times! ), Jennifer Brockett (multiple times! ), Parres Allen, Vanessa Sarraino, Sharon Trulli, Judy Gladman, Brigitte Atkins, Wendy Brennan, Mariel Camilleri, Anne-Marie Miraglia and even my husband. I’m so touched and grateful that these dear people in my life have helped me in this pre-journey experience in such a “core duties” sort of way. P. P. S. And THIS pic is of Jenny Brockett (my most frequent Algonquin Park/Centennial Ridges/non-Kili climbing friends), who scared the bleepity-bleep out of me going so close to this cliff’s edge on August 16th. Happy Birthday to you, today, dear Jenny! 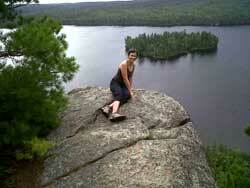 Hope to see you soon, for at least one more (wintery) Algonquin hike before January 15th!